Our expectations were high for Birmingham food and drink when we visited the North of England for a weekend. City breaks in the UK from Dublin are about as easy and cheap as they come so we jumped at the chance to visit Birmingham in the UK when we heard the Pet Shop Boys would be in town for a concert. 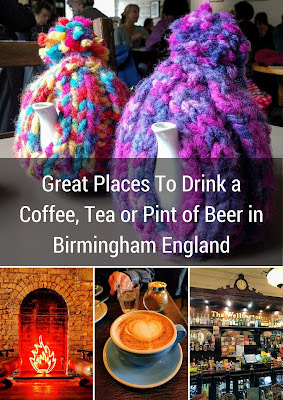 We quickly discovered that Birmingham coffee, Birmingham tea and Birmingham beer are all top notch. No matter what libations you fancy, Birmingham has you covered. Read on to learn about the places we discovered during our 48 hours in England's 2nd city. I'll admit, we were drawn in by Piccadilly Arcade's colorful ceiling art. We soon found that the coffee was also fab. 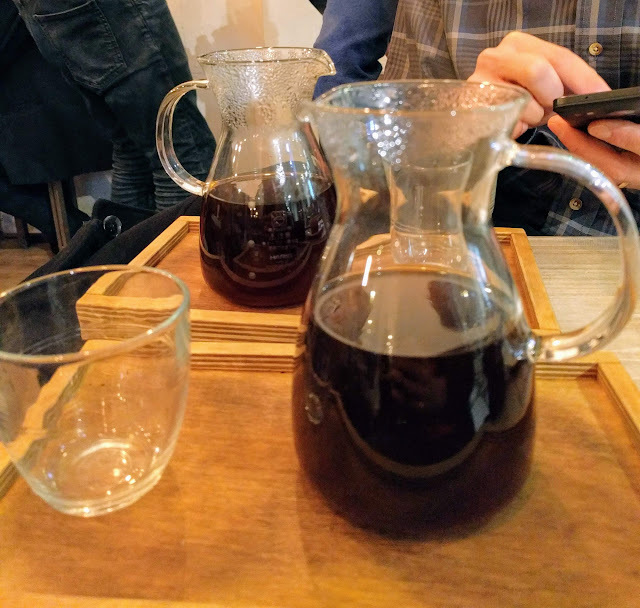 We stopped in for a single origin filter coffee at Faculty Coffee. If you have a sweet tooth, Faculty is definitely the place to go. We sampled a chocolate filled peanut butter cookie but could have just as easily chosen any of the other tempting treats on the counter. If sweets aren't your thing, Faculty shares space with a breakfast place serving egg baps and other savories. 200 Degrees Coffee and Barista School was my favorite place in Birmingham. 200 Degrees serves a well-crafted cappuccino but I have to say that I was won over by the neon faux fireplace. So quirky. 200 Degrees Coffee and Barista School is super charming (and slightly hipster) and is a great spot for a mid-afternoon break if it happens to rain while you're in Birmingham. Java Lounge features bracing filter coffee in a stark white setting. We sipped our coffees below a hand crafted minimalist chandelier. If coffee isn't your thing, make your way to The Warehouse Cafe for a pot of tea and vegetarian lunch. The Warehouse Cafe is located less than a ten minute walk from Birmingham's Bullring shopping district. I was absolutely delighted when my tea was delivered to the table in a pot snuggled up in a colorful tea cosy. It turns out the tea cosies were knitted by one of the members of staff. Made with love! 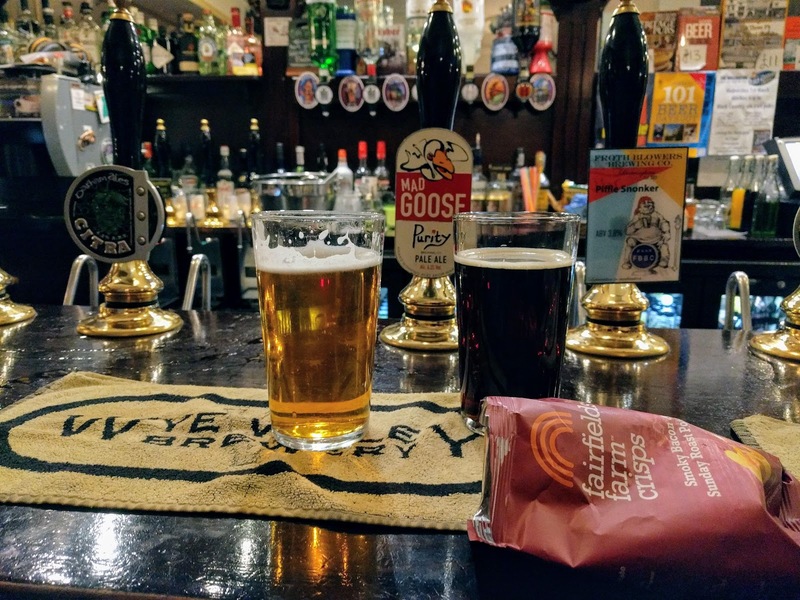 After hours, Birmingham visitors are spoiled for choice when it comes to options for grabbing a pint of English Cask Ale or an alternative adult beverage. 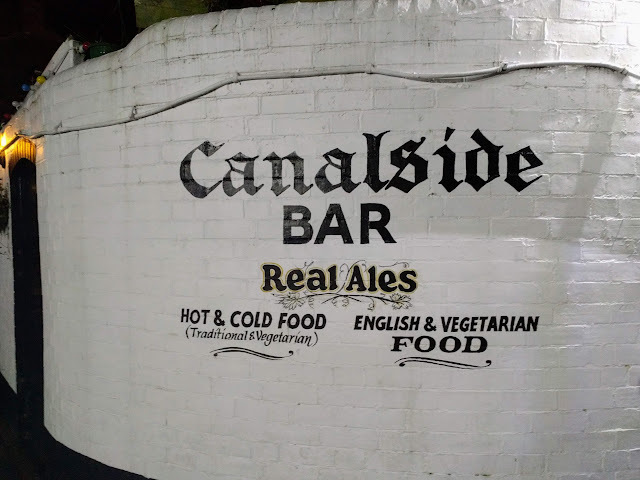 After the Pet Shop Boys Concert at Barclaycard Arena, we walked down the canal path and stumbled upon Canalside Bar. Set in a historic building, there was a roaring fire in the fireplace. 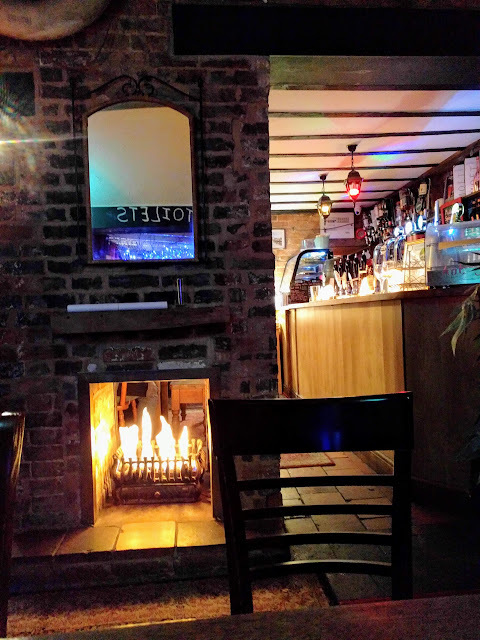 We managed to score a table next to the fire and spent the end of the evening sipping a pint of Sadler's Ales Peaky Blinder and Westons Wyld Wood Cider. Canalside closes pretty early (even on weekends) so expect last call before 11 pm. The Wellington was my favorite bar in Birmingham. It reminded me a lot of an Irish Pub. 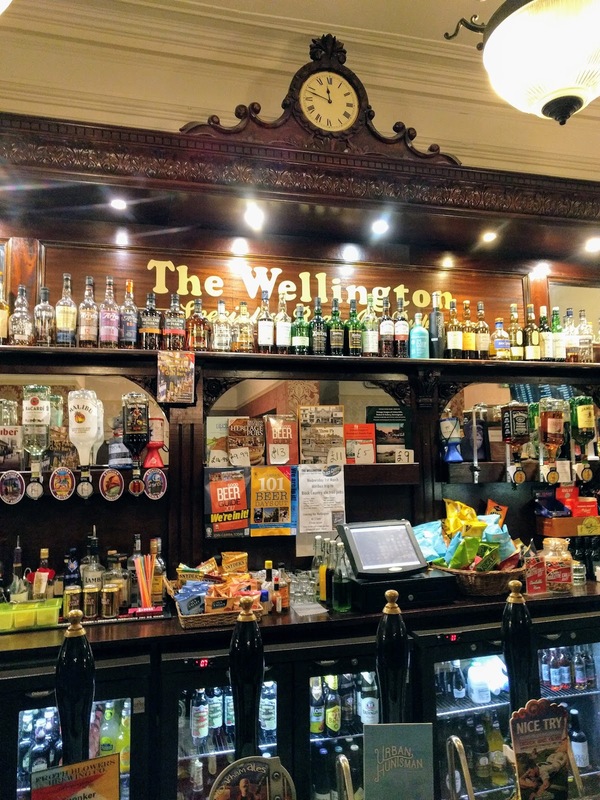 Set in a Victorian-style building and home to a resident cat, the Wellington has great energy. The craic was epic and we struck up conversations with three different locals: Frank, Nige, and Wills while sampling English craft beers. We were having such a great time that we forgot to log the beers we tried in Untappd (Oops!). 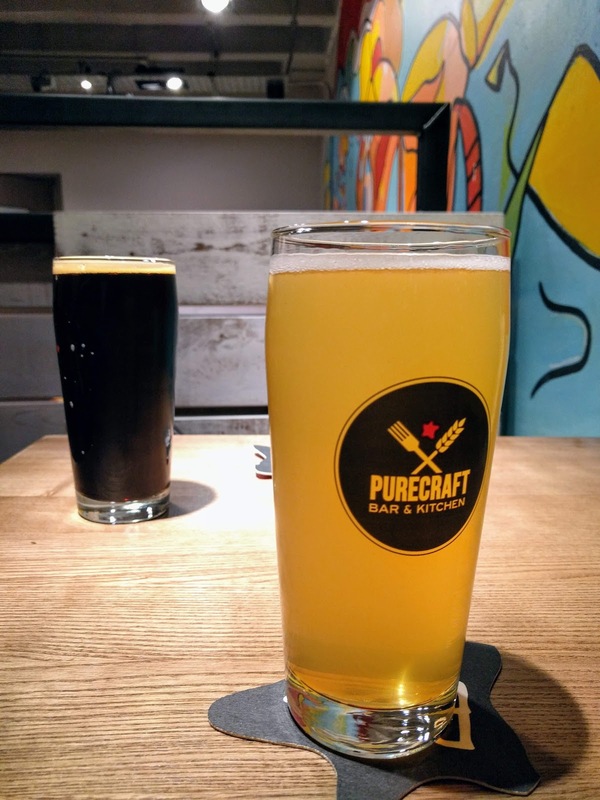 For a more modern vibe in Birmingham, go for a drink at Purecraft Bar and Kitchen. The rotating taps feature a wide-range of craft beers. I opted for a craft cider to change things up a bit. While most English cider is warm and a bit flat (much like the beer), my pint of Dunkerton's craft cider was tart, dry, and fizzy. Really nice! 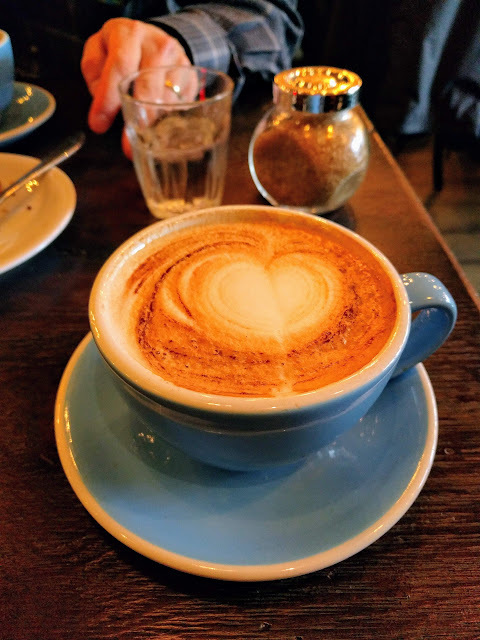 What are your favorite places to have a daytime (coffee or tea) or nighttime (beer, wine, cocktails) beverage in Brum? Read about Birmingham food and drink. Sip Birmingham coffee, warm up with a cup of Birmingham tea, or down a pint of Birmingham beer on a weekend getaway in England.